Veteran’s Day is a solemn day where our nation honors and tributes our nations Veteran’s, and is a day many others tribute the men and women who have worn a uniform of our Armed Forces. 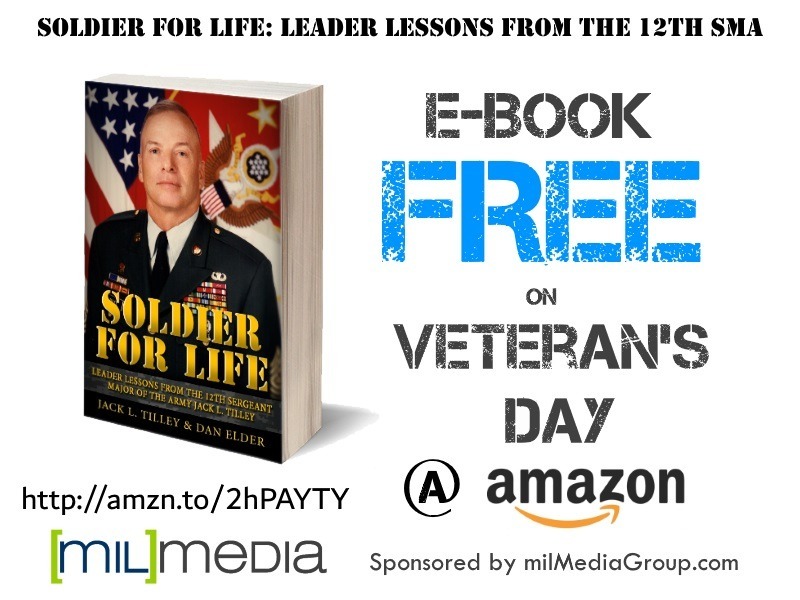 This year and in cooperation with the NCO Historical Society, milMedia Group is offering the Kindle edition of the newly re-released book Soldier for Life: Leader Lessons from the 12th Sergeant Major of the Army Jack L. Tilley free only on Amazon for one day, November 10th, 2017. This digital edition can be easily read on a Kindle Fire, or any device that has a Kindle App. This book is more than just an autobiography of Jack L. Tilley, the 12th Sergeant Major of the Army, it is a series of leadership lessons based on selected stories from his more than 35-year career. The last Vietnam veteran to serve in that position from 2000-2004, SMA Tilley was at the Pentagon when terrorists crashed a plane into the nation’s largest “office building” on September 11, 2001. He and his co-author, Dan Elder weave a story beginning with Tilley’s enlistment into the United States Army in the summer of 1966, his deployment to Vietnam, his ascension to positions of great responsibility, and describe influential events leading up to his eventual selection and assignment as the 12th Sergeant Major of the Army. Unique to his story are the “Understanding Tilley” segments that close each chapter where Tilley reflects on the chapter events, describes how those events influenced him, as well as explore lessons that the reader can use in their own journey. In a review by Military Writers Society of America, reviewer Joe Epply stated that “Soldier For Life” is must reading for every soldier –enlisted, NCO and officer–and every civilian who wants to develop leadership abilities that are essential for success,” On Veterans Day 2017 this important leadership handbook is available to all at no cost, in partnership with Powerpoint Ranger, the pre-made military classes site, and milMedia Group.